Rifle-shotgun combination guns such as this 20-gauge/9.3 X 74 Rimmed as well as three and four-barreled guns are commonly used in Europe. In Europe gun licensing and ownership is so expensive that having the capability of doing more than one type of hunt with a single firearm is very advantageous. As much of the country is forested and shots are often from either fixed ground or elevated stands, guns capable of making rapid shots at close range are used. On some hunts, pheasants, hairs, boars and various deer might present shooting opportunities. The option of having a shotgun, rifle and maybe even a .22 L.R. barrel on the same gun gave rise to over/under and side-by-side patterns of rifle-shotgun, drillings with either two rifle or two shotgun barrels on top and a single rifle or shotgun barrel under those or vierlings with a .22 L.R. or small bore barrel in the barrel cluster. The more barrels the more the guns weighed, but this weight made the guns comfortable to shoot. In the U.S. the most commonly encounted guns of this type are the Savage or Stevens .22s/.410s two-barreled over/unders which were first introduced in 1939 along with the 3-inch .410 shotgun shell. 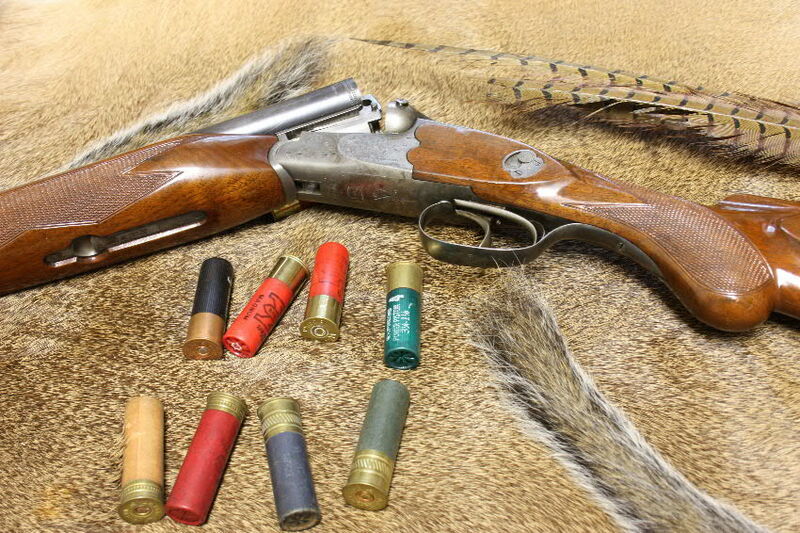 Later models were made which used .20-gauge barrels with various rifle-caliber options. Although there were some historic three-barreled American drillings, such as Colt’s 12-gauge/ .45-70 from the 1800s, the first real influx of these guns came after the end of World War II, when GIs brought these home in their duffel bags. The author's much-used drilling had its stock broken and repaired, but still shoots well. Many drillings had 16-gauge shotgun barrels and rimmed versions of European cartridges. Mine happened to be an 8X57 JR Sauer&Sohn which took the older .318 diameter 8mm bullet rather than the 8X57 JRS which takes a .323 bullet. It is dangerous to use the wrong ammo in these guns. This fact is very well known to European shooters, but not in the U.S. Ammunition in both calibers was, and is, loaded by RWS in Germany and Norma. Over the years my drilling has accounted for squirrels, rabbits, game birds, wild turkey, ducks, geese, deer and even a mountain lion. I had mine restocked to American dimensions with a beavertail forearm and recoil pad on it. It has been on many hunts and spent several field seasons in Alaska as a camp gun. The more firing options there are, the greater the problem of making sure that you shoot the barrel you really want to discharge at the game. If this is your only gun, you will learn how to shoot it, but if it is something that is only picked up once every few years, it is easy to fire a rifle round when you really wanted to use the shotgun. The way to avoid this is to load the rifle barrel only when big game is in sight. You can do this silently with break-open guns. Do this, and you will not waste your hard-to-get rifle cartridges on inappropriate game or potentially endanger someone by unintentionally shooting your rifle. When walking in the woods whcn you do not know if deer or small game might appear, a good approach is to load the left barrel with a shotgun shell and leave the right shotgun barrel (which uses the same trigger as the rifle) empty. This way you can activate the rifle barrel and have it or one shotgun tube instantly available. When only shooting birds, you keep the rifle rounds in your pocket unless you need it to kill an occasional mountain lion, as I once did. I had one shotgun barrel of my drilling bored out to improved cylinder and left the other one extra full. This allows me maximum flexibility at close or more distant targets. Rifled slugs fired from my gun shoot two feet high when the rifle sight is raised. (Activating a sliding button on the top of the wrist arms the rifle lock and raises the rear sight on the barrel.) However, rifled slugs shot closer to the point of aim by sighting over the rib and front sight. Target different slugs and you may find one that will shoot at about the point of aim at 30-yards. With factory loads my rifle barrel shoots 3-inches high at 30 yards and is dead on at 100. I suspect that this was exactly how the gun was sighted. Although my gun was not equipped with scope sights, this option is also available on drillings either using custom claw mounts or more modern mounting systems. A scope does allow more precise shooting at longer distances from a fixed stand, but gets in the way of making rapid shots at moving game. Texas ranch properties, sometimes pre-stocked with exotic animals, are commonly available, but must be considered with care. 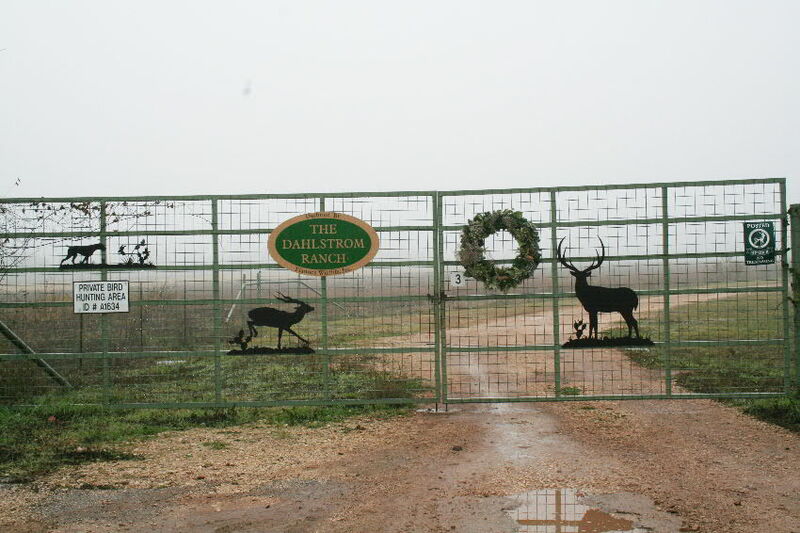 Owning a hunting property were you, your family and friends can go to hunt is a lifelong dream of many sportsmen. Some save for decades to purchase a much-wanted property from other family members, while a few lucky individuals manage to come into more money than they have ever seen in their lives and decide that they can take some of their new-found millions and buy a ranch or farm to hunt on. It is sad to say, but a million dollars does not go as far as it use to. If you are a young guy, it is entirely possible to blow a million on a weekend in Las Vegas, and there are many very interesting guys and gals who will help you do that. Great fun, but nothing to show for it when the money runs out, except often trouble of one sort of another. I was infected with a very bad case of young once, but survived it. At least when buying land you are investing in something tangible. After all, they aren’t making any more of it. The price is always going to go up, right? Not so. You can lose your shirt at this too if you are careless and forced to sell when the market is down. Land investments for hunting are going to be money sinks into which much is put, but there will be little or no return for decades. There will be continuous drains for taxes, improvements, repairs, fencing, feed for stock and so on. If you have a pot of money that you want to invest in hunting lands here is the way to go about it. The value of your property is not how much of it that you have, it is how much of it you can bring to a higher degree of productivity and keep that way. First, decide how much money that you can reasonably afford to invest in the property. Put that in a separate account. Then take one-third of that to actually buy acreage. One third of it for immediate improvements and the final third is held in reserve for unexpected and continuous operating expenses. It is a serious error to put all of your money in your initial property investment, although this will purchase more land. With increasing and rising expenses you also need to have a hefty pot of cash to improve and operate it. Don’t get caught up with competition with your peers in trying to see who can accumulate the largest property or properties. If you do this, you are very likely going to be forced to sell at a loss, should you have any financial reverses. Remember, one-third property, one-third improvements and one-third reserves. That simple rule will get you off to a good start. Salesmen work on commissions. They are eager to close on the most expensive properties that they manage to make a nice paycheck from the sale. They have their, NOT YOUR, best interest at heart. However attractive the properties are, do not under-estimate the considerable costs of maintaining these properties over the short and long-term. 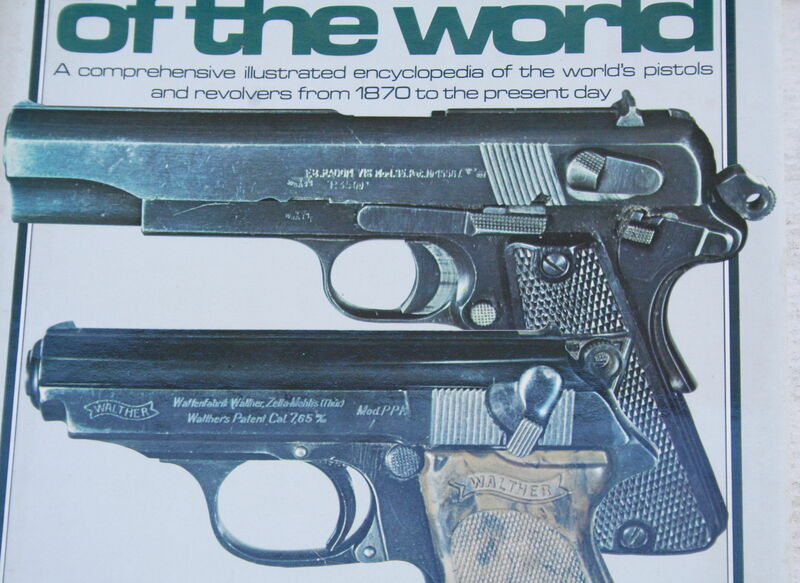 The author liked the Polish Random, shown here on the cover of "Pistols of the World," as the best of World War II's 9mm issue pistols. The world was a different place when I graduated from college in 1963. When I was stationed at Ft. Belvoir, Virginia, I had the chance to purchase, and shoot almost all of the 9mm Parabellum (Luger) handguns that were used by both sides during World War II. During this period the European powers were modernizing their armies in the midst of the Cold War, and these old guns were being shipped by the boatload to willing buyers in the U.S. All I had to do was to go down the cobblestone street to the Interarmsco store at the waterfront in nearby Alexandra, Virginia, and pick out the pistol that I wanted to try. Even at that time, the U.S. was the prime market for such guns. Only a few years before had the laws been changed making it illegal to order firearms by mail. As a young Second Lt. of Engineers, I had no problem purchasing as many handguns as I liked, having them on base, shooting them; and when I figured that I had learned what I could from one, trading it in on another. This was the .308 M14 – .45 ACP Model 1911 Army; although I had done my pre-commission training at Ft. Benning with exactly the same guns used during World War II. Active duty units had the M 14, but the adoption of the 9mm Beretta by the U.S. Army was still some years in the future. One book that I had that was of value then was W.H.B. Smith’s (no relation) Book of Pistols and Revolvers (Stackpole, 1968) which was later supplemented with Pistols of the World (Hogg and Weeks, Presido Press 1978) and DBI Books’ various editions of the Pistol and Revolver Digest, such as the third edition published in 1982. 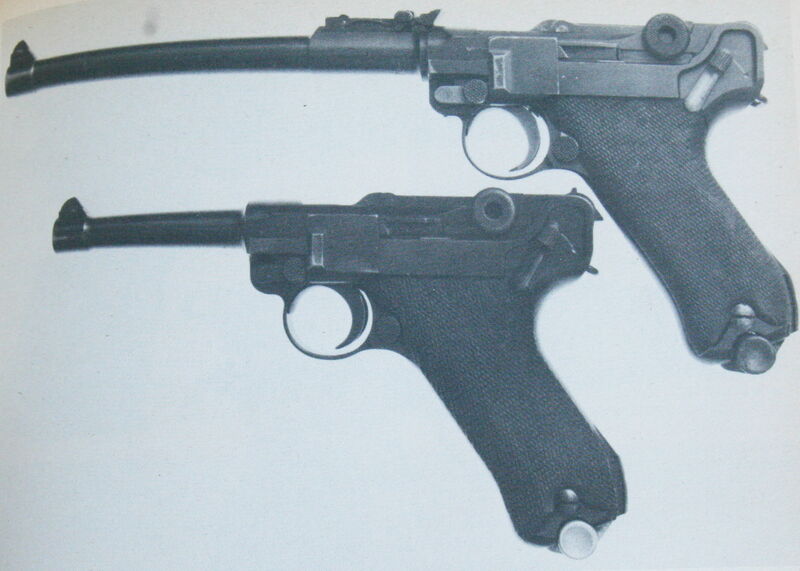 Mauser and Browning Hi-Power with their combination holster shoulder stocks. Photo from the 3rd. Edition of Pistol and Revolver Digest, DBI books, 1982. As is well known by most people, the 9mm Parabellum was developed from the older .30 Luger cartridge in the early 1900s in order to provide a more powerful round. Various high-velocity, but low bullet weight, .30 caliber cartridges had preceded it, most notably the .30-caliber Mauser, used in that company’s semi-automatic pistols. Some of these pistols were converted to 9mm Parabellum, and this was one that I was most anxious to use. Ultimately a wooden barrel (really) of these arrived at the importer, and I was able to get a 9mm Parabellum-chambered Mauser pistol. As was customary for these conversions, a “9” had been burned into the grip and filled with red ink to make it obvious that this was a 9mm. Winston Churchill wrote about using one of the .30-caliber Mausers in South Africa during the Boar War. He found it difficult to shoot well and stressed the desirability of touching the person before pulling the trigger. The Mauser, with its box magazine in front of the trigger guard, felt like no other handgun that I had ever shot. It also had a side safety that was long and best activated by the off-hand. It had relatively mild recoil, but the rounded grip made it difficult to shoot well without it squirming in the palm. I concurred with Churchill. It was a functional and reliable semi-automatic pistol, but difficult to shoot with accuracy. I also found the sights somewhat less than optimum. 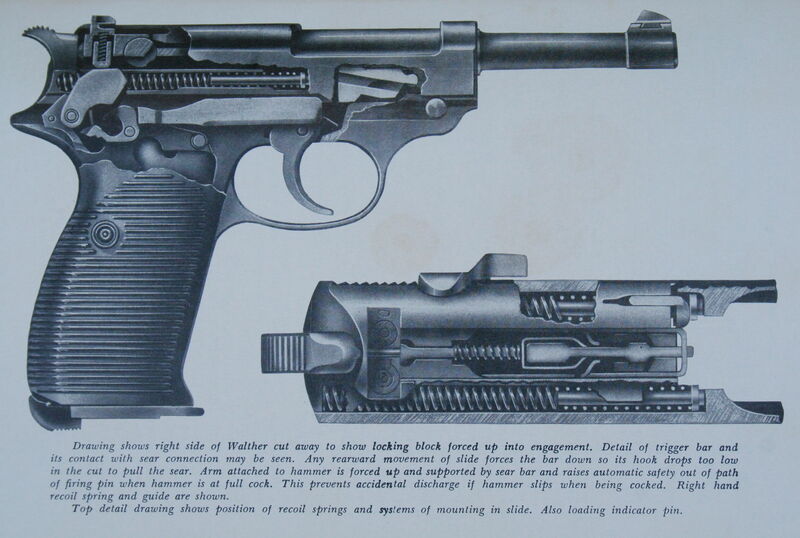 Short and long-barreled 9mm Lugers from the 3rd Edition of the Pistol and Revolver Digest, 1982. This issue also contains a good article on shooting Luger pistols. I had owned a short-barreled 9mm Luger with Nazi markings, and jumped at a chance to trade it in on an Artillery Model with an 8-inch barrel that had been issued during World War I. 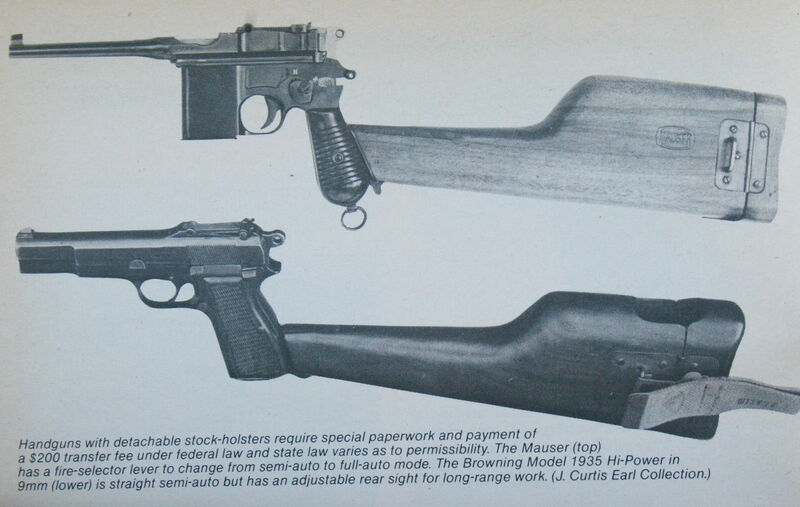 This gun originally came with a wooden holster-shoulder stock and a snail magazine so that it could be quickly converted into a semi-auto carbine. Mine had a bulged barrel, a ground-off stock lug and did not have its holster or large-capacity magazine. The Luger was, and will remain, my favorite handgun in regards to looks and its marvelous expertise in machining and fitting the toggle action. I can easily see how collectors are enamored of it. It is a wonderful-looking handgun, but I did not find that I could shoot it particularly well. One reason is the trigger is connected by levers that makes it difficult to tune. Another is that when the grip when was held naturally in my palm the barrel pointed to the left – rather than being a straight-line extension of the wrist, like with the Colt Model 1911. Lugers can give reliability issues, although I had no problem with mine using U.S. factory loads. I enjoy looking at Lugers today at gun shows, but would not own one today, except as an example of mechanical artistry. From WHB Smith's Book of Pistols and Revolvers, Stackpole, 1968. The option of having either a double-action first shot or a more deliberately aimed second shot was a valuable attribute for this pistol. Not so desirable was its very thin, light-weight barrel which made it difficult to shoot well at distances beyond a few yards. With a myriad of small springs and screws it was very easy to lose parts when the gun was disassembled. (Keep this in mind if you ever do it.) As a combat handgun it certainly had desirable attributes, but as a shooting handgun I could not find too much to recommend it. Designed from the outset as a 9mm pistol, the Hi-Power incorporated a higher capacity 13-shot magazine in a wider grip, but remained a single-action pistol during the World War II period. When Belgium was over run by Nazi armies, production of this pistol was continued with the addition of Nazi acceptance stamps. It was one of these war-production pistols that I shot. As a shooting pistol, I liked the grip of the pistol better than the Luger, but found its wide grip uncomfortable for my relatively small hand. It pointed better than the Luger, felt more natural and the 13-shot magazine was a decided improvement over the 8-round magazine in the Model 1911 Colt semi-auto. The Hi-Power’s shape, feel and shootability was better than the P-38, despite the Browning’s only being a single-action semiauto. This particular gun had a long adjustable rear sight, a smaller version of the Mauser rifle sight, and was cut for a combination shoulder-stock holster that was unavailable to me. The Swedish version of the Lahti was an interesting pistol. Mine was the P.-40 made by Husqvarna. Photo from "Pistols of the World" Presido Press, 1978. The Swedish Lahti was among the last of the European 9mms that I had an opportunity to purchase, and the very last that I sold. 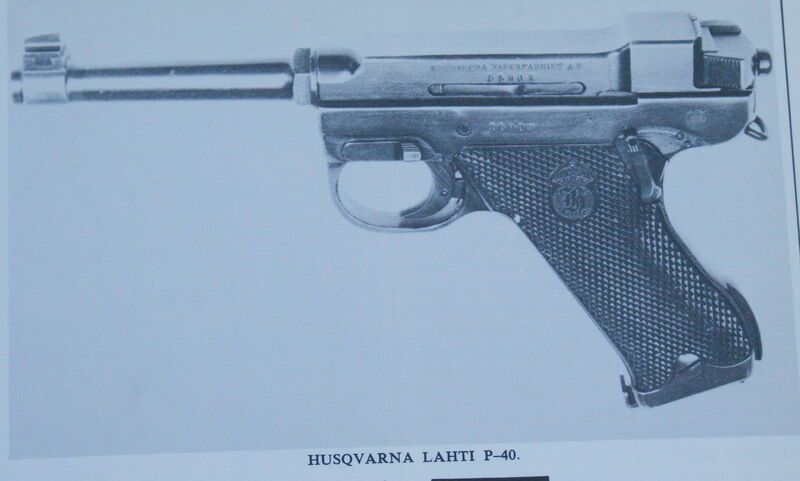 Although designed in Finland, the Swedish version was made during the 1940s and continued as that country’s service pistol after World War II. As I recall, this Luger look-alike felt heavier than Luger’s with similar barrel lengths, but shot no better. The light barrel-heavy frame combination made the gun difficult to point well and it offered the same problems as the Luger in not lining up naturally in the hand. I found myself grasping the pistol and then having to twist it into place with my other hand to regrip the gun for target shooting. My pistol had apparently never been issued. I kept it as long as I did as a curiosity, rather than because I was impressed by its shooting characteristics. My example of this pistol had received hard war-time use and arrived with rust pits and a not-so-hot barrel. Of all the European pistols, this one felt best in the hand, had adequate combat sights, and I found myself longing for a better-preserved example. Even so, the gun handled well and shot well for a combat pistol. I heard that the pre-war production pistols were very nice, but I have never seen or shot one. Between the German and Russian occupation of Poland, these guns really went through the mill, and mine looked it. If you have noticed a trend in my remarks that the more the pistols looked like the Model 1911 Colt semi-auto the better I liked them, this is correct. The added forward weight of the long slide is helpful and the grip, particularly with the swelled magazine housing, felt and feels better to me. Although Colt never commercialized the concept, long slide versions of the 1911 were produced in small numbers by custom makers, and some more powerful semi-auto rounds with soft-nosed bullets were produced that would work in this platform. I followed and read about these concepts with interest, but never used them. I purchased and shot what was more easily available in the .44 Remington Magnum in revolvers and the Thompson/Center single-shots with their longer (10-15 inch) barrels as hunting guns. Astra produced two models of these rather strange-looking blow-backed pistols. The 400s were able to shoot the 9mm Luger, Largo, Styer and 38-Colt Super, and the Model 600 was almost exclusively chambered for the 9mm Luger. The Model 400 that I owned liked the .38 Colt Super best, but would digest round-nosed 9mm Luger cartridges. This gun was touchy in what it liked to be fed in the way of Luger cartridges, preferring round-nosed jacketed bullets and not tolerating target-level loads. The heavy springs use to retain these powerful pistol cartridges make this gun particularly hard to operate. Once the operational characteristics were mastered and if used with ammo that it liked, it was a reliable gun. The gun has tiny sights that I found difficult to use for target work and plinking. 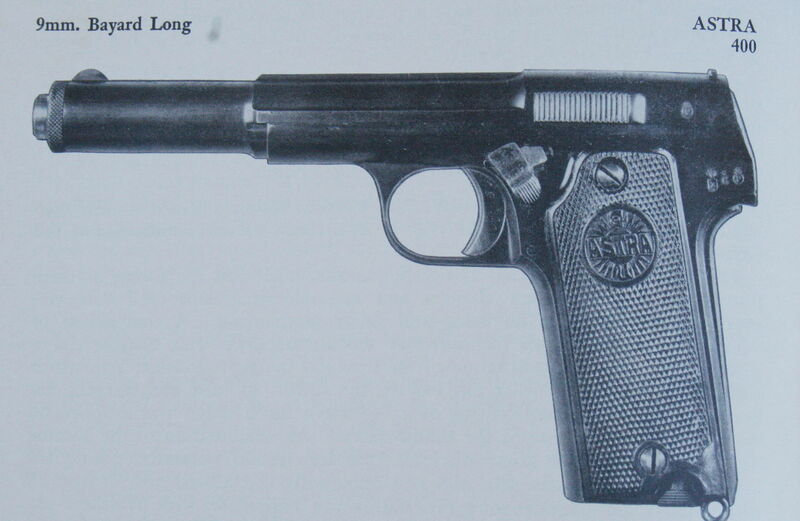 Colt likely produced some 9mm Luger chambered Model 1911s while developing their semi-rimmed .38-Super cartridge, but apparently never made any in 9mm for anyone during World War II. They did offered this chambering in later designs like the Colt Commander. Because of the supply of free military ammo for the Colt .45 and my having to purchase factory stuff for the 9mms, I switched to the .45s and larger caliber handguns and hardly ever looked back. Never again was I to own a 9mm of any type because I was becoming more interested in handgun hunting. The 9mms – .38 Supers, Largos etc. did not then offer either soft-point bullets, sufficient power (arguable in case of the Super), or were illegal for taking deer-sized game animals in states where I lived. Both Italy and Spain made large numbers of 9mm Parabellum handguns post World War II and many were sold in the U.S. However, these countries did not use this cartridge in the nations’ wartime handguns as first-line pistols. In order of power the various 9mm started with what is known in this country with the .380 ACP. Hungary had an about worthless double-action only semi-auto in this caliber that was issued. Italy produced large numbers of .380 Berettas for holster carry for police and other units, although the 9mm Glisenti was their official military pistol cartridge during World War II. The 9mm Bayard Long is the Spanish 9 mm Largo and is also quite similar to the 9mm Steyr. There was also a 9mm Browning long, but this one was never imported into the U.S. and is only found in a few European civilian pistols. I looked at the Austrian Steyr pistol, but because of the stripper clips needed to load it and the special ammo (all of which was corrosive at the time), I never purchased one. The semi-rimmed 38 ACP and the 38 Super fill out the 9mms (both non-military cartridges) that were available during the World War II years. The Russian 9mm Makarov was adopted after the war. Shooting all of these guns was an interesting experience. My only regrets was that I did not bother to take any photos of the guns while I had them. As I have the opportunity to shoot some new digital images of the guns, I will change-out these photos. 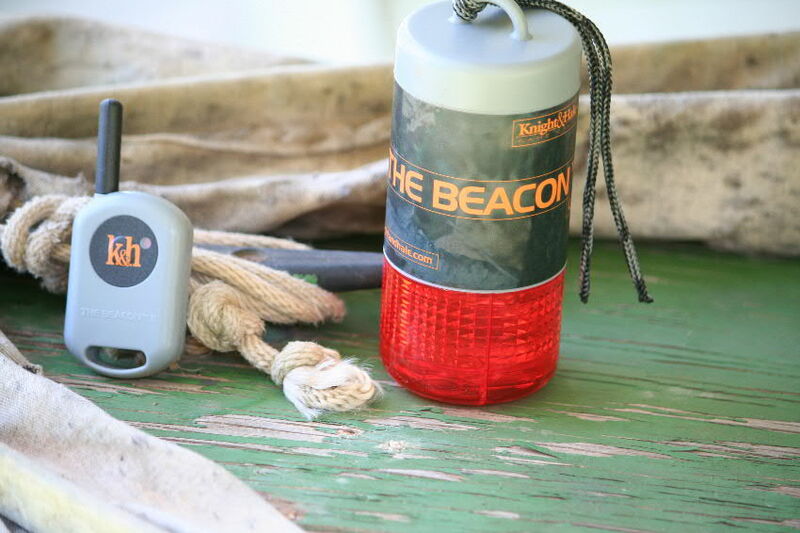 The Beacon by Knight&Hale can help you find your deer stand in the dark and your way back to your boat. When a person goes on a hunt in a Wilderness Area it is logical to assume that they will go with maps, compass, GPS units, satellite communication equipment and an emergency beacon. However, most people get lost in smaller areas closer to home where they did not think it necessary to take the forgoing or even simple survival gear. This point was recently brought home to me when I spent a cold night out in the woods as a result of getting disoriented on a squirrel hunting trip on a peninsula and being caught when darkness fell. What happened here is that I took my boat and paddled it over from a public launch to the peninsula which was accessible only by water because it had been cut off by a canal located at its neck on the eastern side. So the once peninsula, now island, extended from east to west as it projected out into the lake. The map that I had been provided was a very poor map, and I did not have an adequate idea of its scale. My hunt plan was to go out, bag a few squirrels and then return to my boat to do some bowfishing in the lake before dark. No one can get lost on a peninsula. Right? All I had to do was to walk along any shore line and ultimately get back to my starting point. Wrong. First off the peninsula was much larger than I expected and covered about five square miles. Secondly, it was not possible to walk along the shore because of deep drop offs and thick jungley vegetation next to the shore line. Even had I intended to do so, walking around the island in the water was unwise because the weather was near freezing, and the last thing that I wanted to do was to risk hyperthermia by getting my relatively few clothes wet. Although it had been cool the night before, by the time I started my hunt I was only wearing trousers and a T-shirt. As I was just going to step out of the boat and quickly return, I left matches in my truck, took no food with me, did not take my GPS or compass, left even the poor map I had in my shirt pocket in the boat and just grabbed the gun, a few shells and a bag for the squirrels. As I followed barking squirrels from clump of trees to clump of trees I walked in a random pattern and when darkness approached I started back walking east. Ultimately I found myself approaching full dark in a thick tangle of vines and second growth and water on all sides of me, except for the way I had come. I was on a prong of the peninsula, getting cold and increasingly disoriented. I had already circled back on myself twice. It was time to sit down, take stock and wait until daylight until I could see what I was doing and use the rising sun as a directional beacon. Thrashing around in thick stuff in the dark was only inviting personal injury and exhaustion. It was better that I stayed the night where I was. It was going to be a cold night, but nothing life thretning, just uncomfortable – so long as I stayed dry. As I was by the shore, I had the chance of attracting a passing fisherman and getting a lift back to my boat. Where is a fisherman when you need one? None came. After a cold night partly covered up by rushes that I had cut and insulated by a carpet of them on the ground, I found my way to the highest point on the peninsula and quickly returned to my boat with clear directional guidance provided by the rising sun. The lesson in all of this is, take basic location and survival stuff with you even if you are only going out for a short woods walk in a unfamilure area. I have hunted, lived and worked for months at the time in Alaska and elsewhere. Spending an uncomfortable night in the woods came as an inexpensive reminder to me not to forget my basic location and survival equipment. Like any business venture, radio shows cost money to produce and this must be forthcoming from sponsorship, ads, sales of books, guifts and grants. 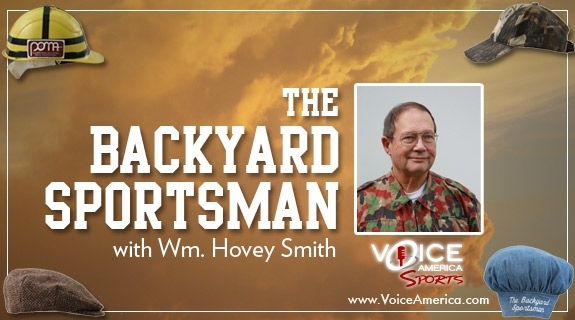 My previous show on VoiceAmerica Sports, ”The Backyard Sportsman,” is a solid, high-information-content show; but failed in 10 weeks to produce sufficient sponsorships or product sales to continue broadcasting. I think that this is disappointing because I believe that I was, and am through iTune on-demand re-broadcast, reaching a younger market that needs solid information on hunting and outdoor topics. This market will continue to expand and after only a month, I was reaching over 10,000 listeners. If after hearing a few shows you think likewise, consider sponsoring a revitalization of this show or purchase some of my books and other products. My new show “Hovey’s Outdoor Adventures,” faces exactly the same challenges and will have the same fate if sponsorships, ads or book sales are not forthcoming. The message is simple, “If you want my show, then buy my stuff and/or help me find sponsors for it.” Although the new show will be adventure and storytelling based which would appeal to a larger audience, it has exactly the same requirements to be a money-producing business. For those who were following my Outdoor Business Modules on The “Backyard Sportsman,” these will be continued through the new show until all 21 are covered. For a review, go to http://www.thebackyardsportsman.wordpress.com to see a list of the Modules that were covered in past shows. If there is interest, I will publish a whitepaper with an outline of the Modules. Watch for that on my website, www.hoveysmith.com. A YouTube video was recorded to make these points. To view it, click on: http://www.youtube.com/watch?v=lbW4R3SGrXc&layer_token=a728edcaca126e66 or watch below. 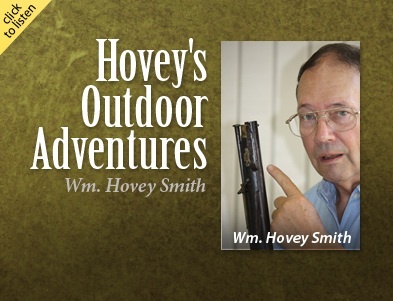 “Hovey’s Outdoor Adventures” broadcast over Internet Radio through WebTalkRadio.Net will be an hour-long weekly show that will feature storytelling to relate interesting hunts that the author and his guests have done around the world with a variety of hunting tools. There will be a lady who hunts hogs with spears, a man who has taken all of North America’s big game with a bow with no sighting equipment, another who takes much of his game with handguns while other guests utilize muzzleloaders, crossbows and antique-pattern guns. No stranger to all of this, Hovey will conclude the show with one of his own hunts featuring a variety of muzzleloaders, crossbows and guns to take game that ranges from squirrels, to swan, to wild boars, Cape buffalo and so on. Look for the unusual in these stories in regards to the game being taken and the tools being used. You will seldom be disappointed. A brief video about Hovey’s show is available on YouTube that you can view at: http://www.youtube.com/watch?v=lbW4R3SGrXc&layer_token=a728edcaca126e66. I had another one posted here, but liked this one better. Hovey’s Outdoor Adventures Radio starts in Nov.
Radio web-page photo for Hovey's new show with WebTalkRadio.Net. Hovey will start a new Internet radio program “Hovey’s Outdoor Adventures” on WebTalkRadio.Net in November, 2010. This will be an hour-long entertainment-based show as compared to the content-based “The Backyard Sportsman” now appearing on VoiceAmerica Sports radio. Story telling from both Hovey and his guests will dominate the new show which will also contain segments on wild-game cooking and starting an outdoor business. Click on the video below for a personal announcement. If you have problems viewing this version, this video is also on available on YouTube by activating the following link: http://www.youtube.com/watch?v=UNvqdiUwE3w&layer_token=00e2247dba1f83cd.